Extreme circumstances caused Dr. Paul Branson to make difficult choices in an attempt to escape a madman. One of those choices involved him stealing his enemy’s plane, which later disappeared beneath the murky waters of the Congo’s Kibali river. A defector named Cijen aided Dr. Branson’s attempted escape. Although Branson no longer knew who to trust, he had to believe in someone. As it would turn out, there would be no survival without Cijen’s help. Paul had made the right decision. One of the most painful choices Branson would ever make would be to attempt to save a little girl with leukemia from the clutches of his evil foe – a decision that may cost all of them their lives. Branson, a seasoned pilot, would still find the task of landing a small, bullet-riddled aircraft on the winding, crocodile and snake-infested river in the Congo to be one of the most difficult maneuvers he’d ever attempted – especially without an engine. The men walked cautiously, their hands on their weapons. Jarrod had no idea where Branson and Cijen might be, or if they were even alive. But he knew they had guns, and he refused to give up his advantage. That’s when Jarrod spotted what he was looking for. In the midst of escaping, and then trying to survive a plane crash, Branson knows Jarrod and the remainder of the Quinn’s forces will not be far behind. That being the case, what chance do they have of survival? If God is with Branson, when will He show himself? 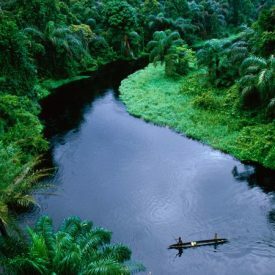 In this region of the Congo, it is difficult to walk several meters without facing death. It was my intent to paint the most accurate picture of the balance between desperation and panic – a fine distinction when one finds that he is no longer near the top of the food chain, and he is not capable of defeating the one who is. But trust in God is ever true – His sovereignty does not guarantee or even imply our safety. It simply means that He knows what is best. Which may mean – that we die. 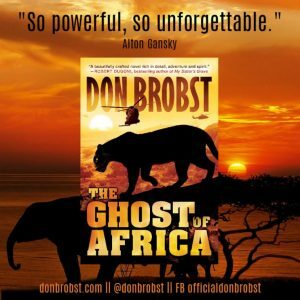 To know for sure, read The Ghost of Africa. I am in the midst of the battles that ensue. I will take you there. Come with me!